A reciprocating saw is more useful than a Swiss Army Knife. It can work as a demo saw or a fine-finishing saw. With that being said, this power tool is used for remodelling work, a drywall saw, a pipe cutter and a conduit cutter. You should keep in mind that it is being used in constricted places. The reciprocating saw has been introduced 60 years ago by Milwaukee Tool. Nowadays, different brands such as Hilti, Makita, RIDGID, Ryobi, DeWalt, and Skil are offering reciprocating saws. In fact, you will find individual models from Woodworker and Great Neck Saw as well. Will the blade reverse cut on both upwards and downwards? Can you extend the handle and make it down as a pistol grip? Does the body of the saw swivel? In recent years, the manufacturers or different brands have provided advanced reciprocating saws with modern-day features. But still there are some fundamental features that are important for this kind of tool. So, let’s read them in details. If you are using a corded saw, a high amp rating would cover most of the jobs. Usually, the top amp rating is 15 but if you have more than 10 or 12, it would be enough for your work. 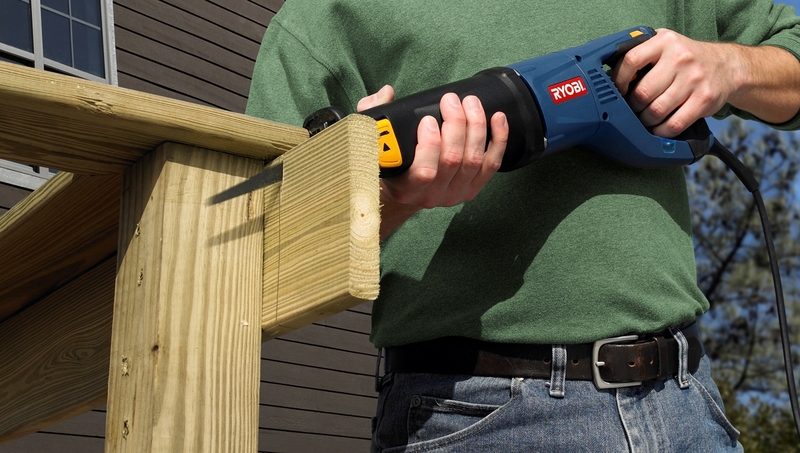 Recent models of Milwaukee, the Sawzall 6519-31 and 6509-31 is able to cut up to twice as fast. They have an amp rating of 12 as well. Now, if you are working in a tight area, you can take a second reciprocating saw with an amp rating of five or six. On the other hand, if you are working with a cordless reciprocating saw, you will be happy and satisfied. The main reason is that it comes with increased power and run time. This exceptional feature is provided by today’s Lithium-Ion batteries like – RIDGID’s Hyper Lithium-Ion battery. This battery is able to offer up to 50 percent additional work output and up to 50 percent more recharges. Aside from these things, a cordless reciprocating saw is suitable to different climates and weather as well. It will efficiently operate in extremely hot and cold temperatures. Typically, a stroke length is called the distance the blade goes forward in one cutting stroke (strokes typically range from ½ to 1½ inches). Now, if the stroke is long, it will have more teeth cut per stroke. So, a long stroke will cut faster while running at the same stroke per minute speed. However, it requires more clearance at the backside of the job and more amps for driving the blade. As a result, the general principle is for demolition and fast work, using a long-stroke model would reap rewards. On the other hand, a light and short-stroke is suitable for delicate and intricate work. Furthermore, an orbital reciprocating saw will bring oscillation to the regular reciprocation. It will bring it in a slight up and down motion perpendicular to the direction of the cut. The blade tips will move in an oval, up and down along with back and forth. In short, it will produce quick cuts and it will be suitable for cutting woods. Even if the reciprocating saw has a counterbalancing built, you will feel a vibration in your hands. In that regard, a heavy saw will dampen the vibration more than the lighter model. But, there is a fact that working with heavier models will not be appropriate all the time. This is why you have to pick a saw that suits you on all fronts. As a word of advice, when you are buying a reciprocating saw, try to lift the saw to check whether the weight is comfortable with you. Tool-free blade changes- Different reciprocating saws have a tool-less clamp for retaining the blade. This makes the tool change procedure fast and easy. Light– In case of a plunge cut into a drywall for a switch box, it will be useful to have a saw with LED illumination. It will make things easier for you. Variable speed and speed control– Almost all the saws have variable speed and control. This control is regarded as the ‘Trigger.’ You will also find some saws that have a two-speed gearbox. This is considered as an extra subtleness or distinctive speed. Electric brake– Some new models have an electric brake that will stop the brake when the trigger is released. The bottom line is a reciprocating saw is extremely useful for cutting jobs. The major concern here is that you have to choose a unit that is powerful (you can opt for less power in case of lighter cutting jobs) and possess an appropriate level of stroke. You should also take weight and vibration level into account to have a comfortable operation. If every aspect of the saw is covered appropriately, you can rest assure that you will have a great tool at your disposal. READ: How to Get Your HVAC System Ready For Summer? I would love to add a reciprocating saw to my tool kit. As you mentioned, they can be helpful in demolition, trimming studs, and for those hard to reach places. I like how you mention you need to consider the weight and vibration of the saw you are getting. Depending on the type of work you are doing, having a heavy duty saw can be essential for industrial projects, or a lighter saw for detail work. Thanks for the post.